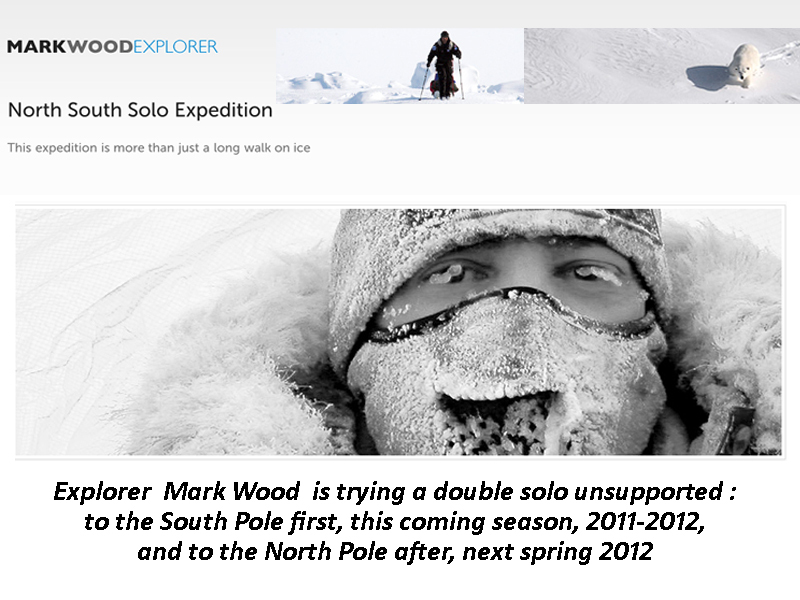 This year, explorer Mark Wood will attempt to be the first adventurer to ski -solo and totally unsupported- to both South and North Pole consecutively. The first steps will be taken in Antarctica – an estimated journey of forty five days will bring him to the South pole and half way to succeeding (departing from Hercules Inlet). From there he will head straight to the Canadian high arctic where the second part of the voyage will begin. Across broken sea ice, Wood hopes to arrive at the North Pole within sixty five days. A total journey including the transitional period of one hundred and fifty five days across two thousand Kilometres of Antarctica ice and Arctic sea ice. Excerpts from the press dossier : "... For me this is more than just a long walk on ice. To date I have led over twenty five major expeditions in the extremes of our planet -I see my role as an explorer has been to communicate my experiences to students and stimulate interest about their own planet. "With this I have set up an educational schools programme for the expedition so students can link with me on ice and experience every breath step and emotion along the way. I understand the enormity of my expedition -many teams and individuals have tried to do what I’m hoping to do but have had set backs. I feel I have the experience and understanding of what I’m getting into. Preparation plays and incredible part in the success of a venture like this but a lot of the success will be down to what mother nature has install for me. Success depends on the weather allowing the planes to drop me off -also how servia the open leads are on the arctic ocean and how quick my progression is over ice ridges that block the route to the North Pole. Laying my stall out on a website prior to doing the expedition is also difficult as its OK talking about it but I really need to do it first. However, due to the educational programme and creating interest around the human aspect of the journey I have felt it necessary to include it in the site. ..."
Wood’s expedition to the NP cancelled ?